For a number of years this was the Broken Arrow Historical Society Museum's website. Content is from the site's 2010 - 2014 archived pages and other outside sources. 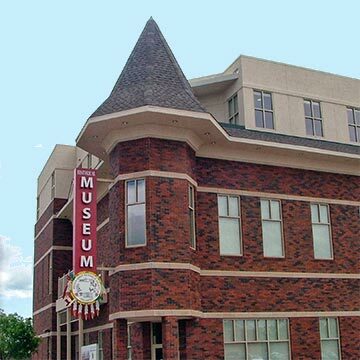 Located in historic downtown Broken Arrow, near the site of the original train depot, the Broken Arrow Historical Society Museum's mission is to gather and preserve local and regional history and artifacts that enrich the heritage of our city. The historical society works to share local history in interactive, informative exhibits. Peruse our website for information about the museum's, including special exhibits. Visiting the Museum section provides information about location, admission, and hours of operation. The museum's Gift Shop offers guests a variety of "Made in Oklahoma" gifts such as shirts, food, and educational books. Please remember that the Historical Society and Museum are a non-profit organization and run on the generosity of our members and the local community. If you are shopping on Amazon this Christmas season, please check for the Historical Society on their Smiles program. A portion of your total will then be donated to the museum. The BAHS Museum raises its operational costs through donations, fundraisers, and membership dues. We accept donations in any denomination. You may also submit donations to the museum in person. Admission is $5 adults or $8 for two adults. Members and children under 18 years old are admitted for free. From Creek Turnpike: Exit at South Elm Place. Drive north on Elm Place to Houston Street. Turn east on Houston and follow to Main (4 blocks). Turn north on Main, and we are within view, on the west side of the street. From Broken Arrow Expressway: Exit at 161st East Avenue (Elm Place). Go south to Kenosha. Turn east on Kenosha and go to Main. Turn south on Main and continue 0.8 miles. Museum is on the west side of Main. The museum is open to the public for self-guided tours during normal hours. Docent-led Group Tours are available. Visitors may choose to schedule a tour with a trained docent who will share anecdotes and provide an enriched understanding of exhibits. Each tour is tailored to the age and preferences of the group. Please call 918-258-2616 to schedule to a docent-led tour. Special discounts in the Gift Shop and on Rental Space. Members also support an annual Historical Society Scholarship for a local senior and are Partners in Education with Centennial Middle School. The Broken Arrow Historical Society is an educational 501.c.3 non-profit, organized in 1975. The BAHS Museum is a proud member of the Oklahoma Musuem Association. Go back in time to 1828 when the first Muscogee Creek settlers were arriving from Thlikachka, Alabama. Stories explain how the Muscogee came to be in Indian Territory, traditional lifeways, and legends of the first permanent settlers of the area. Sound tracks add to the setting created within a cedar post roundhouse. Learn why a "broken" arrow isn't really broken at all! One of our most popular exhibits, and the only one of its kind in Oklahoma. Follow the history of the Childers family and home from 1861 to 1948, and enjoy the workmanship of the hand hewn oaken logs that have endured 150 years. Fully furnished, the full size cabin tells many stories of lifestyles and ways of doing things before electricity. A reproduced depot houses a working scale railroad as well as artifacts from the original MKT depot: luggage cart, china, pullman blanket, ticket window, and salvaged pieces of the old wooden depot. Coal was strip mined in eastern Broken Arrow until after World War II. In 1934, Broken Arrow shipped out more rail cars of coal than any other city in the state. Photos and artifacts show the progession of mining technology. A Tribute to Veterans---Includes Special Story of Lt. Col. Ernest Childers, Medal of Honor Recipient for Valor in World War II. Fantastic place to visit and learn about military history from the Revolutionary War to the present. The museum has artifacts of all types of weapons, documents, postors, clothing, etc. I would recommend this to everyone who is interested in learning about the sacrifice American men and women gave so we could all have our freedon. Free guided tours are available from veteran volunteers is a big plus. I could not believe how well put together this small museum was! The different collections from wars were well represented.The guides were excellent. Who knew there were so many military collectors in this small town. Good trip for any age. Wonderful history lesson. They have items from the Revolutionary War up to present. They have an introductory video and docents to guide you through. Entertaining way to learn about US Military History! This is a new museum in the Rose District in Broken Arrow, OK. It is the collection of a retired Colonel who served in World War II. It is a cozy museum with exhibits that are logically arranged from early conflicts to the most current one. There are items such as snow boots made from rope that were worn in WWII and uniforms, posters, weapons and a film. The volunteers are very knowledgeable and provide information that is not found in the history books. The entry fee for adults is $5 and children under 18 are free and since this is a nonprofit organization, really helps keep the museum up to date. Out in the north courtyard are bricks with names of soldiers and dates of their service, along with flags from all the branches of service. It's a great place to go to see history and feel how special our Military service men and women are for their service.